Many of from us have been facing skepticism and awkwardness while sharing our smartphone with others or to our beloved persons. Here explains a smart technique to hold your privacy while sharing your smartphone. 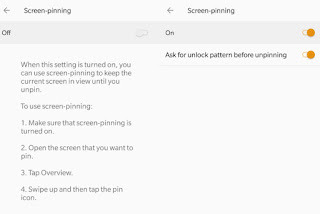 A small feature built right inside your Android operating system called as “Pin Windows”, this feature allows you to pin specific windows on your screen while keeping your smartphone locked. 1. Open ‘Settings’ of your smartphone. 2. Go to ‘Security & Lock screen’ option. 3. Scroll down and look for ‘Screen Pinning’ and tap on it to open. 4. Turn on the toggle to activate this feature. 5. Also, turn on the option ‘Ask for unlock pattern before unpinning’. This will ask for the password or pattern before unpinning the app. 6. Now open the app you want to pin and tap on ‘Recent’ button to open the recently used the apps.